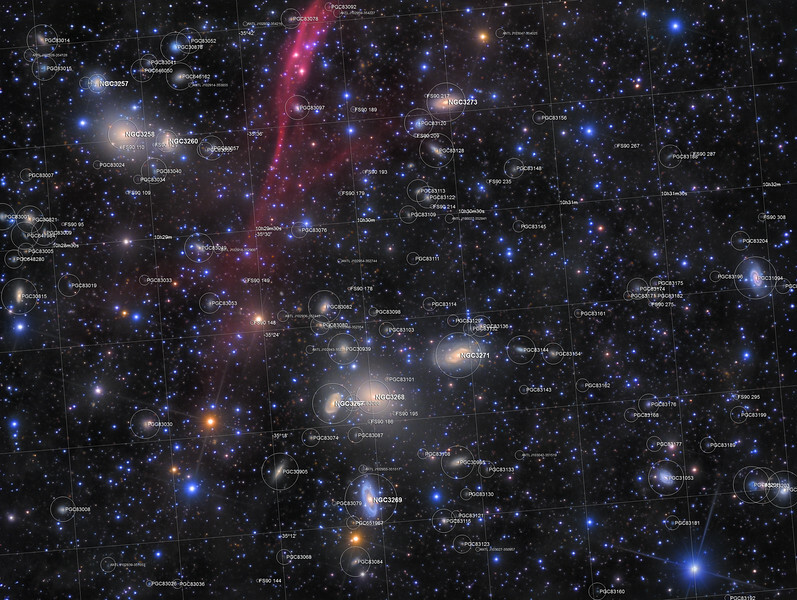 This annotated image is an attempt to label every confirmed member of the Antlia Cluster in the field of view. A total of 157 members are identified and the markers seem to correlate well with visible galaxies in the field. The faintest member galaxies are ultra-faint dwarfs with magnitudes ranging from 19 to 22. Many more galaxies are visible in the background but these are more distant and not members of the Antlia Cluster. ANTL: Custom extract covering faint dwarf galaxies from Castelli, A. V. S., Cellone, S. A., Faifer, F. R., Bassino, L. P., Richtler, T., Romero, G. A., ... & Caso, J. P. (2012). Galaxy populations in the Antlia cluster–III. Properties of faint early-type galaxies. Monthly Notices of the Royal Astronomical Society, 419(3), 2472-2488. Each extract was imported into PixInsight as a custom catalogue and annotation layers were generated and overlaid on the original colour image.